Best and Worst States for Jobs: Will jobs improve in 2010? The Bureau of Labor Statistics released state unemployment for December 2009 today. Every state in the U.S. saw its unemployment rate rise in 2009. The Best State for Jobs and Employment in 2009 was North Dakota. It had the lowest unemployment rate in the nation at 4.4%. Its unemployment rate increased by 1.1% in 2009. South Dakota, Nebraska, Iowa, Oklahoma and Kansas were also Top States for Jobs and Employment. The Worst State for Jobs and Employment in 2009 was Michigan. Its unemployment ended the year at 14.6%, an increase of 4.4% in 2009. 21 states and D.C. saw their unemployment ranks increase by 3% or more in 2009. 2009 was a very bad year for those seeking employment. Nevada, Rhode Island, South Carolina, California and D.C. all were Worst States for Jobs and Unemployment in 2009. They all have unemployment rates of 12% or higher. Minnesota and North Dakota had the smallest unemployment increases in 2009 with increases of only 0.8%. The Worst States for Unemployment Increases were West Virginia and Nevada which had increases of 4.6% in unemployment. The list of Best and Worst States for Jobs and Employment is below. It is presented from best to worst based on year over year changes. Politically, these are very poor numbers for the Obama administration. With the large health care bill off the table for now, let’s hope businesses will become a little more willing to hire in 2010. With unemployment rising and economic stress increasing, the trust we have in our neighbors and community is of increasing concern. We want to live in a Safe States as they are Best States to Live. The poll asked people if they believed a lost wallet with $200 in would be returned. Nationwide 70% of people believe that their wallet would be returned with money still in the wallet. Large States according to Gallup are generally viewed as less trustworthy. People in the Southern half of the country do not trust their neighbors as much as people in the North. See Gallup’s map below. People in the South do not trust their neighbors as much as the North according to Gallup. Chart courtesy of Gallup. We ran our September 2009 Best and Worst States for Job openings. Job Openings dropped an alarming 6.2% on September 30 as compared to July 31. This is particularly discouraging as we had seen our only increase in job openings this year in July. This reversal ratifies the year long downward trend. We develop our analysis from data listed by the nation’s largest job posting service CareerBuilder.com. It is a good proxy for job openings nationwide. Job Openings nationwide shrank in September to 217,040 from 231,370 in July, a drop of 14,330 job openings. 48 States saw jobs shrink. Alaska, North Dakota, South Dakota and Montana saw the biggest percentage job opening losses. Kentucky Jobs, with an increase of only 180 job openings. and Utah Jobs, up 30, were the Top States for Jobs and the only 2 states in the nation that showed improvement since July 31. The Bureau of Labor Statistics released state unemployment numbers for August 2009. State Employment statistics show a continued worsening. 14 States and DC now have unemployment rates of 10% or greater. North Dakota has the nation’s best state employment rate with 95.7% of its people employed. All 50 State Unemployment rates are listed below. The Best States for Employment were North Dakota, South Dakota, Nebraska, Utah and Virginia. The Worst States for Employment were Michigan, Nevada, Rhode Island, Oregon and California. The Bureau of Labor Statistics released the July State unemployment numbers this past week. More ugly in most states. 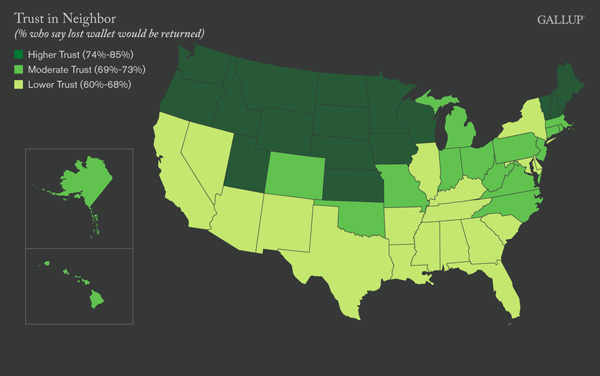 The Best States for Jobs are primarily heartland states. The Best State for Jobs is North Dakota with an unemployment rate of only 4.2%. Nebraska and South Dakota at 4.9% are the only other states under 5%. Utah is our fourth Best State for Jobs at 6%. You will have a decent chance to find a job in Iowa, Oklahoma, Wyoming and Montana. If you are looking for a job in a state with very high unemployment, you might want to consider a state where the opportunities are broader and fewer people looking. In other words, consider changing your state. Michigan at 15.2% is the Worst State for Jobs. Approximately 1 in every 6 people are unemployed. Rhode Island, Nevada, Oregon and California are some of the Worst States for Jobs with rates all close to 12%. For our lastest post on Best and Worst States for Jobs go to Which States had the Best Employment Markets in 2009? Will 2010 Job Market Improve? Job openings have decreased 1.57% since the end of January nationwide even though 30 states have more job openings than in January. The Top Ten US States according to population have shown a 4.1% decrease in job openings. California, the US largest state, has 9.3% lower jobs available than in January. With a 11.6% jobless rate, California appears to be a poor state for job seekers. Illinois is also a Worst State for Jobs with a 14.2% drop in openings along with a 10.5% unemployment rate. The US unemployment rate will not improve significantly without the Top Ten States also improving as these states have about 50% of the US population. The US States continued to see rising unemployment in June. 16 States, if you count DC, now have unemployment rates greater than 10.0%. 38 states and DC saw increases from May. All 50 states and DC have higher unemployment than a year ago. Our national unemployment rate was 9.5% in June. The July national jobless numbers will be released on August 7. Michigan continues to be the Worst State for Jobs with a 15.2% jobless rate. North Dakota is the Best State for Jobs with only a 4.2% unemployment rate. 3 of the 5 largest states by population have rates greater than 10.% They are California, Florida and Illinois. California has more than twice as many jobless as any other state with 2.146 million jobless in June. California has the most unemployed people in the nation. The next largest amount of unemployed are in Florida with 970,000 jobless in June according to BLS statistics. We will be releasing shortly our updated analysis of job openings. Unemployment will continue to rise until more job openings start to appear. List of Best and Worst States for Jobs is below. Are Business Friendly States Best for Jobs? Which States had the Best Employment Markets in 2009? Will 2010 Job Market Improve? Click on the category Best and Worst States for Jobs on the right navigation for our collection of articles on Jobs. We now have 8 states with unemployment above 10%. Michigan is the Worst State for Jobs with an unemployment rate of 12.6%. Oregon is also very bad for jobs with a rate of 12.1%. California, our most populated state, has an unemployment of 11.2% meaning that 1 out of 9 people are out of work. South Carolina also is a Worst State for Jobs with unemployment of 11.4%. The Best State for Jobs in March was North Dakota at 4.2%. The other Top 5 States for Jobs were Wyoming at 4.5%, Nebraska at 4.6%, South Dakota at 4.9%. Iowa and Utah were tied for fifth with 5.2% unemployment. The data shows that the Best States for Small Business are not all the Best States for Jobs at this moment. 5 of the top 10 Best States for Small Business, for example, have below average i.e. higher, unemployment. 45th ranked Iowa for example has the 4th best employment in the U.S.
As mentioned in the previous post, the SBEC index is primarily a tax based system and high or lower taxes are not the only reason companies grow and create jobs. It would appear intuitive over time business friendly states should create more business and jobs. We will continue to watch this during the cycle as the better states may grow first and faster.